Scherzer has earned 50.7 Box-Toppers points over 2016 and 2017. He ranked first in 2016 with 25.7 and second in 2017 with 25.0 (behind overall leader Red Sox pitcher Chris Sale’s 25.1). Dodgers pitcher Clayton Kershaw, who led players in Box-Toppers two-season point totals for each of the past four seasons, falls to second place this year with 47.5 points. Kershaw ranked second in 2016 with 24.4 and third in 2017 with 23.1. At the end of 2013, he had 42.5 points over 2012 and 2013, ahead of Scherzer’s 35.1. At the end of 2014, he had 53.2 points over 2013 and 2014, ahead of Scherzer’s 40.2. At the end of 2015, he had 57.2 points over 2014 and 2015, ahead of Cubs pitcher Jake Arrieta’s 43.8. An at the end of 2016, he had 50.1 points over 2015 and 2016, ahead of Scherzer’s 46.7. Indians pitcher Corey Kluber leads American League players in two-season Box-Toppers point totals with 43.2, third overall. Kluber led AL players in 2016 with 21.2 points (fifth overall) and ranked second among AL players in 2017 with 22.0 points (again, fifth overall). Kluber ranked fourth in two-season totals at the end of last season—he had 34.6 points over 2015 and 2016. Red Sox pitcher Chris Sale, who led all players in 2017 with 25.1 Box-Toppers points, ranks fourth among players in two-season totals with 38.5. He had 13.4 points in 2016, sixth among AL pitchers. Sale ranked eighth in two-season totals at the end of last season—he had 32.2 points over 2015 and 2016. Giancarlo Stanton of the Marlins leads National League batters in Box-Toppers points over the past two seasons with 20.7. Stanton ranked 19th among NL batters in 2016 with 6.5 and second in 2017 with 14.2. Last year, Stanton ranked 13th among NL batters in two-season totals with 12.0 points over 2015 and 2016. Elvis Andrus of the Rangers leads AL batters in Box-Toppers points over the past two seasons with 20.2. Andrus ranked 10th among AL batters in 2016 with 9.2 and third among AL batters in 2017 with 11.0. Last year, Andrus ranked 42nd among AL batters in two-season totals with 9.2 over 2015 and 2016 (he earned no points in 2015). 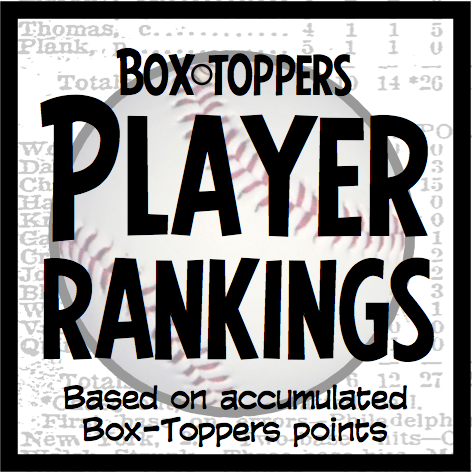 Interestingly, Box-Toppers two-season point totals were a slightly better barometer than the single-season 2017 point totals to reflect the winners of baseball’s major postseason awards—both leagues’ Cy Young Awards and Most Valuable Player Awards. Box-Toppers points category leaders for 2017 won just one of four postseason awards but category leaders for 2016-17 won three of the four awards. The only player to lead a Box-Toppers category in 2017 to win one of the four major postseason awards was Nationals pitcher Max Scherzer, who led NL pitchers with 25.0 Box-Toppers points and also won the NL Cy Young Award. Scherzer, who led NL pitchers with 50.7 Box-Toppers points over 2016-17, won the NL Cy Young Award. Kluber, who led AL pitchers with 43.2 points over 2016-17 won the AL Cy Young Award. Stanton, who led NL batters with 20.7 points over 2016-17 won the NL MVP Award. Edwin Encarnacion of the Indians led AL batters in Box-Toppers points in 2017 with 12.1. He ranks second among AL batters over the past two seasons with 20.1 over 2016-17, just 0.1 behind AL batting leader for the period, Elvis Andrus of the Rangers (20.2). Anthony Rizzo of the Cubs led NL batters in Box-Toppers points in 2017 with 15.5. He ranks third among NL batters over the past two seasons with 18.5 over 2016-17.